Used for centuries in some of the most recognizable structures of Aztec times, this beautiful and enduring product comes into the 21st Century with style and sophistication. Offered in a host of finishes from tumbled to domed, cross cut honed to vein cut polished, this line has been expanded to coordinate with any interior style. 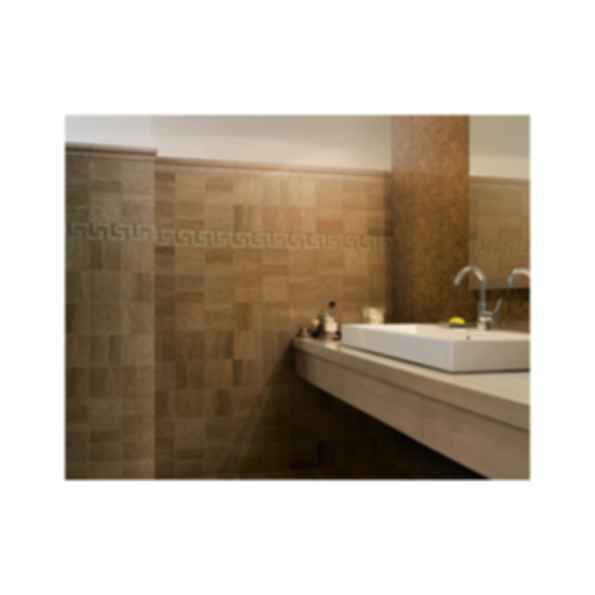 The three wall sizes, 3x6, 4x4 and 6x6, are available tumbled, domed or vein cut polished along with two floor sizes, 12x12 and 18x18, that are available in the filled and honed finish to allow for a wide range of installation options. Also offered are two plank widths: 4" wide and 6" wide. All of our sizes are rectified to allow for a stunning finished installation. Offered in the most modern and widely used colors, Noce and Desert Cream Imperial, available in all sizes, shapes, and finishes. These two stone colors vary in shade with the natural veining and movement of this classic product. A large offering of listellos, chair rails, pencils and a variety of decorative mosaics offer something for every conceivable installation. Most notably are two sets of mixed decorated tiles in 4x4 and 2x2. Designed to coordinate across colors, these porcelain pieces are decorated to resemble old style hand painted tiles and add a rustic hand-made feel to the line. A stunning addition to the PietraArt portfolio, this collection of Travertine from old-Mexico has been selected and finished using the highest standards.